Christmas time is the period that everybody looks forward to. It is the most exciting, magnificent and pleasant holiday of the year. But it’s only one side of the holiday. When we organize celebration at our home and invite a lot of our friends and relatives for Christmas dinner it can really make damage to our family budget. When you spend money for delicious food and drinks you aren’t able to buy desirable presents for your friends and family. That’s why you should try to control the purse. 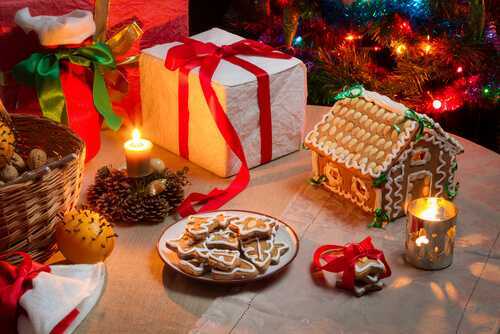 I hope that the following ways of Christmas celebration will help you to do that successfully. The best way to avoid huge expenses is to buy the ingredients for your Christmas dinner beforehand. Never leave it to the last day. If you buy food a few weeks before the holiday you will save your money greatly. It’s not a secret that at the last days before holidays, not only Christmas, all the food in the shops is very expensive. Don’t worry that products can spoil if you buy them earlier. Just freeze them. Meat and fish are the products which you can easily buy a few weeks in advance. When the time comes you will only open the freezer and start cooking. The next idea can really prevent you from spending much money for Christmas celebration. You can easily ask your friends to bring something with them. It will be a great contribution! Nowadays it is very popular in the U.S. It is called a potluck style. You will be very glad to see that some of your guests bring a bottle of wine or some tasty dessert. Besides for them it can be also a great pleasure. We have a good opportunity to make our Christmas menu varied. There is a great choice of seasonal vegetables which you can use for cooking different dishes. You should remember that not only meat can be used for your exquisite menu. What is more important, this idea will enable you to save some money. Certainly you can avoid all these preparations for Christmas dinner. And I’d like to recommend you to visit one of your friends’ celebration. It’s a wonderful idea! In this case you will be a guest. You just come to the friend’s home, enjoy the evening and don’t feel all the fuss while cooking dinner. But I advise you to plan your celebration in advance because there is such possibility that your plans may not coincide with your friend’s plans. As a result you can stay alone at home on Christmas Day. You can make such an agreement that every year a different relative or friend will invite the others. The biggest mistake of all people who organize Christmas dinner is the attempt to cook as much food as possible. Try to avoid that. There are so many days of winter holidays during which your guests consume a lot of high-calorie dishes and don’t do much physical exercise. That’s why if you cook too much food your guests will not be able to eat everything and you will throw your tasty dishes. If you make right proportions you will not suffer from lots of expenses. Be sure that you control the energy at your home. Very often people are shell-shocked when they see their bills after Christmas. The expenses are enormous during this holiday. I have a few recommendations for you how to avoid them. For example, if you have many guests who are sitting in one room there is no need to use the heater so you can turn it off. Don’t leave the TV set when nobody watching it, lights and other appliances. Be careful with your decorations! When you go to bed, turn off all of them. Nowadays there is a great number of some special offers in different shops and supermarkets. Especially we can find discounts when big holidays are coming such as Christmas. That is one more reason to buy ingredients for your dinner in advance as the last day prices will rise up. While shopping beforehand you can face such problem as crowds of people in stores and long lines. But that is worth doing. The most popular drinks for Christmas dinner are champagne and wine. And the presence of these drinks on your Christmas table can influence your purse greatly. Try not to serve too much of alcohol, and control the amount of its consumption. Better use small glasses and pour a bit of wine. Your guests will enjoy a delicious taste of drinks. Tell us about other ways and recommendations how to celebrate Christmas without spending much money.